SA2 시리즈는 표면 접착이 용이한 써모커플 온도센서로, 평평하거나 굴곡진 표면에 2가지 다른 설치 방식으로 이용할 수 있습니다. 센서는 반응 시간을 더 빠르게 하는 자체 접착식 알루미늄 호일 스트립 내부 표면에 접착되어 있습니다. 참고: * Specify J, K, T or E thermocouple Type. For standard size connector, replace "SMPW-CC" in the model number and replace with "OSTW-CC", no additional charge. 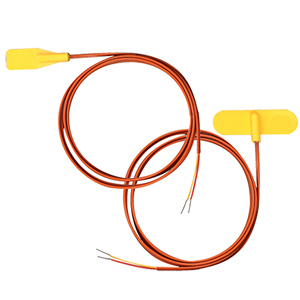 For additional lead wire, add additional cost per 300 mm (12"). For a male straight M8 plug add "M8-S-M" to the model number for additional cost, for a male straight M12 plug add "M12-S-M" to the model number for additional cost. For a male right-angled M8 plug add "M8-R-M" to the model number for additional cost, for a male right-angled M12 plug add "M12-S-M" to the model number for additional cost.